Cambridge University Press, 9781107008267, 350pp. 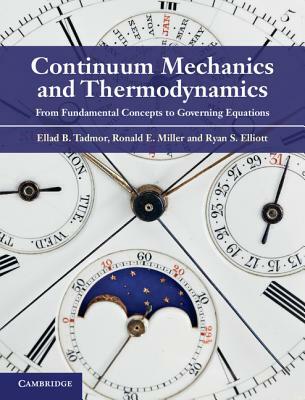 Continuum mechanics and thermodynamics are foundational theories of many fields of science and engineering. This book presents a fresh perspective on these fundamental topics, connecting micro- and nanoscopic theories and emphasizing topics relevant to understanding solid-state thermo-mechanical behavior. Providing clear, in-depth coverage, the book gives a self-contained treatment of topics directly related to nonlinear materials modeling. It starts with vectors and tensors, finite deformation kinematics, the fundamental balance and conservation laws, and classical thermodynamics. It then discusses the principles of constitutive theory and examples of constitutive models, presents a foundational treatment of energy principles and stability theory, and concludes with example closed-form solutions and the essentials of finite elements. Together with its companion book, Modeling Materials, (Cambridge University Press, 2011), this work presents the fundamentals of multiscale materials modeling for graduate students and researchers in physics, materials science, chemistry and engineering.